This is my first dessert/sweet post on this blog. I think Helba is a good introduction to Levantine sweets. 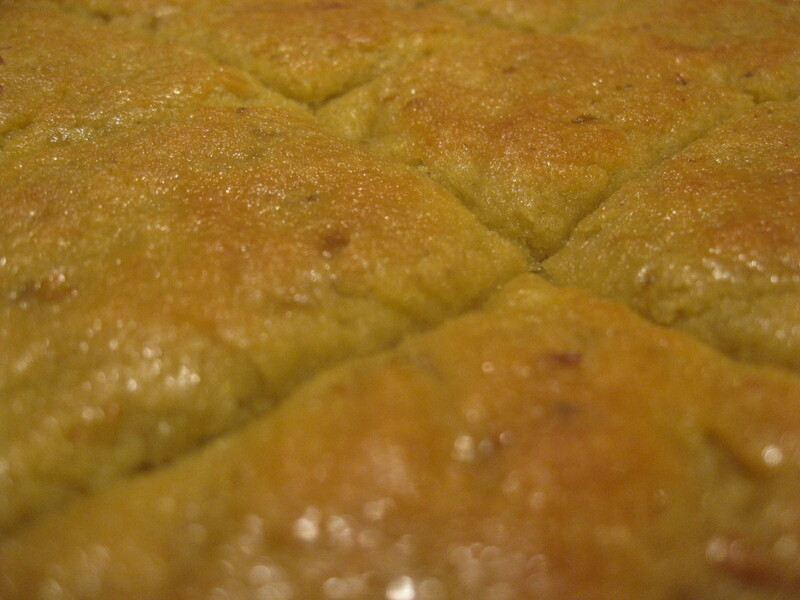 Helba is a traditional sweet, dense cake bar made of fenugreek seeds and sweetened with a sugar syrup. This is a completely vegan dessert. You will note that the cake itself only has 1 tablespoon of sugar that is dissolved with the yeast. That is not an oversight. The sweetness comes from the simple syrup that is poured on the cake at the end. Fenugreek seeds, Helba (حلبة) in Arabic, have a fragrance reminiscent of maple syrup, and a very distinct flavor. It is considered by many to be a digestive aid, and metabolism booster (though probably not in cake form 🙂 ). It can be made into a tea for those purposes. Another commonly held belief – across many countries and cultures – is that fenugreek is an effective galactogogue. For this reason, fenugreek concoctions have routinely been made for and given to new mothers. A good friend of mine (from Sudan) brought me a wonderful tasting fenugreek pudding-like drink right after my second child was born. I have been told that there is a similar drink made in Egypt. 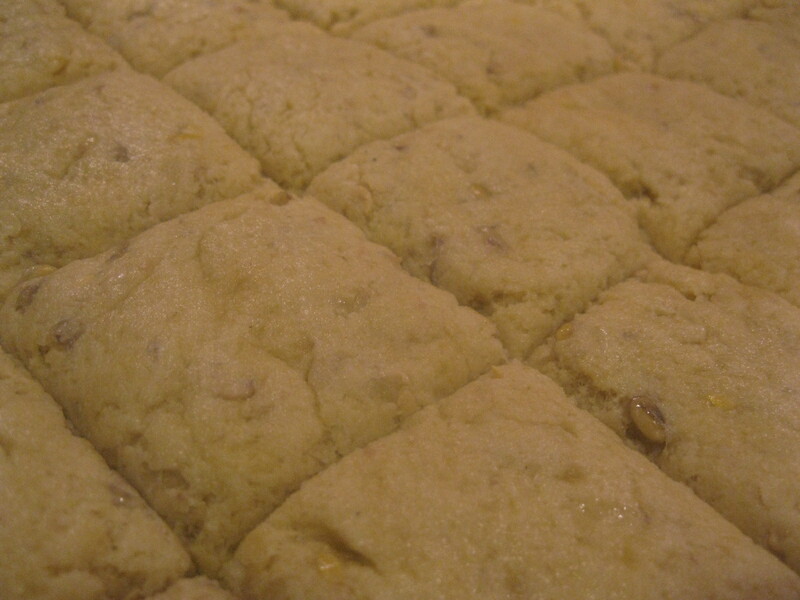 In Palestine and Jordan, any new mother can expect to receive a tray of these helba cake bars. It is not to be enjoyed only by new mothers, though. Any and all members of the family can (and do!) enjoy this dessert. This is fairly easy to make, though there are a few steps, and you need to factor in rising time. The seeds must first be boiled in water, and the yeast proofed in warm water. Everything is then mixed together, and patted into a tray. The cake is allowed to rise while a simple sugar syrup is made. 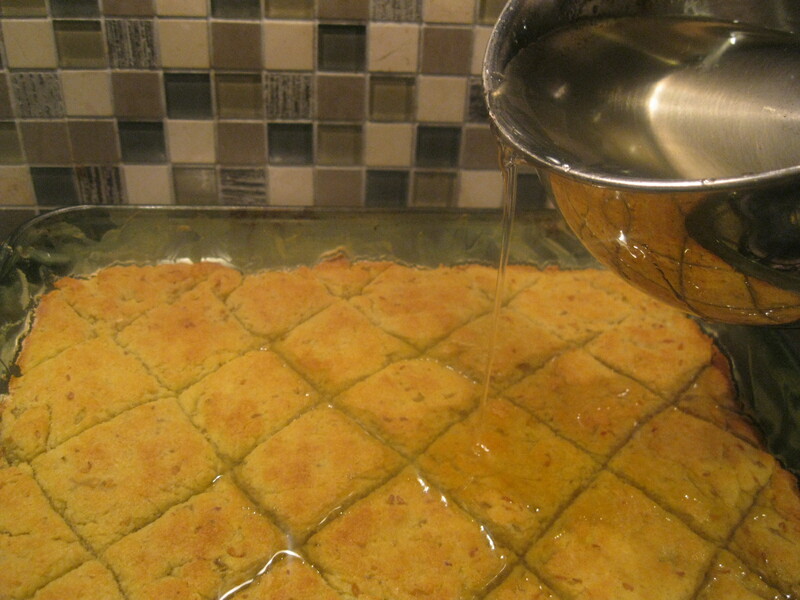 After the cake is baked, the cooled syrup is poured over the hot cake and allowed to soak in completely. A rule of thumb is whenever working with a Middle Eastern style dessert with a sugar or honey syrup, either the dessert OR the syrup must be hot, and the other cool. Never both. I prefer to make the syrup as soon as I start working on the dessert, so that it can be completely cooled by the time the hot dessert is ready for it. It will look like the cake is drowning, but, fear not, it will absorb all the lemony syrup. NOTE about tray sizes – this works either in a 9″x 13″ or 11″x 15″ tray. I used a 9″x 13″, but this also tastes good when the bars are a bit thinner as well. In a small pot, put 2 cups of water and 2 tablespoons of fenugreek seeds. Bring to a boil, and allow to boil until the water is reduced to 1 cup. Remove from heat and allow to cool. Do not discard seeds. !n a small bowl or mug, dissolve 1 tablespoon yeast and 1 tablespoon of sugar in 1/2 cup of warm water. Allow to stand for about 10 minutes, until a foam forms on top. If a foam does NOT form on top, throw it away and start over with new yeast. Combine the flour and semolina in a mixing bowl. Add oil. 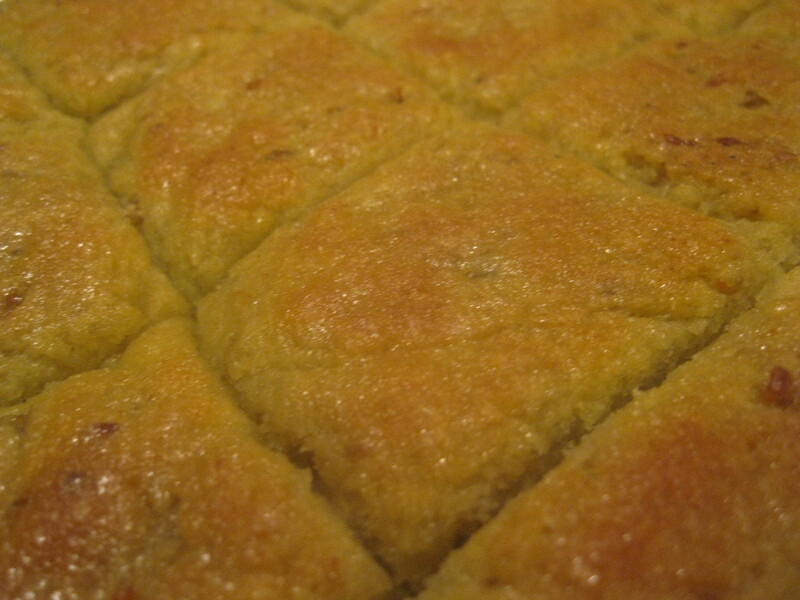 Using your hands, rub the oil into the semolina and flour until completely incorporated. Add the fenugreek seeds and water that you have reduced and cooled. Add proofed yeast/sugar/water. Knead to combine. 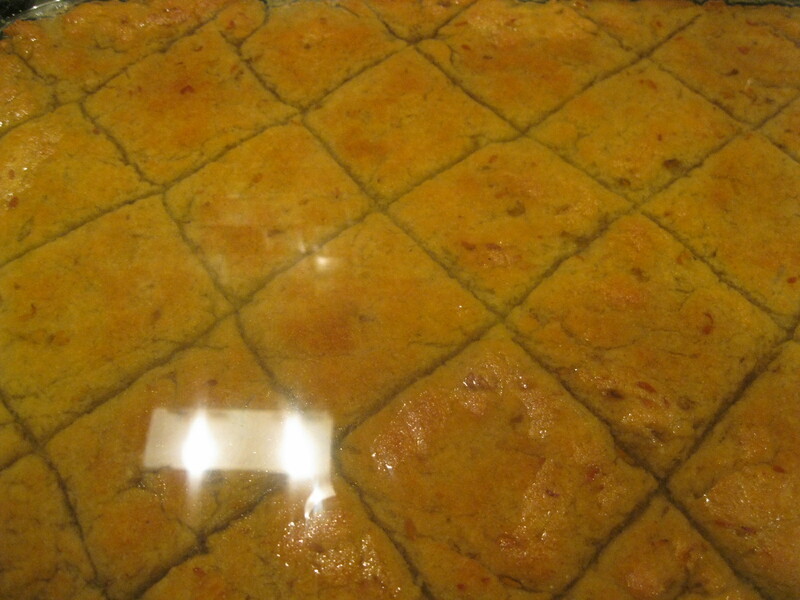 Oil a baking tray with tahini. Start out with a tablespoon, and add if needed. You just want to create a slick surface. 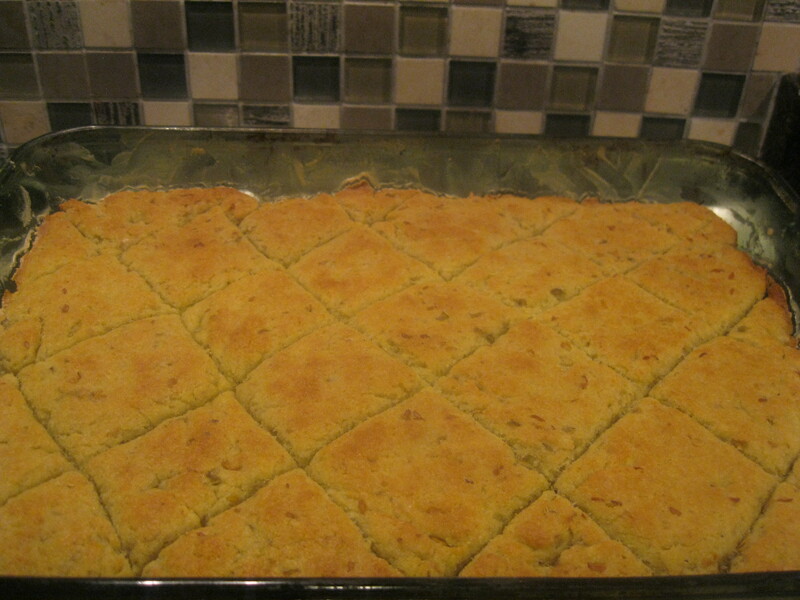 Pat dough into the baking tray in an even layer. Cut diagonally down one side, then turn tray the other way, and cut diagonally down the other side, to create diamond shapes. These came out more like squares, but imagine they are diamond. Cover with a clean towel or cheesecloth, and allow to rise 2-3 hours. For syrup – Place sugar, water, and lemon juice in a small pot. Stir over medium-high heat until sugar is dissolved. Bring to a boil. Reduce heat and simmer for about 10 minutes. Remove from heat and allow to cool completely. Preheat oven to 400F. Bake for about 25 minutes. Turn on broiler, and broil for about 5 minutes, until golden. Remove from oven and allow to stand for about 5 minutes. Pour syrup cooled syrup evenly over hot helba. Let stand 10 minutes to soak in completely. Serve warm – or allow it to cool to room temperature, if you can wait that long . I’m really intrigued by this! It looks wonderful and I love breads of all kinds – especially sweet ones :-). I have some helba and I wanted to find a recipe to use it. I’m glad I found this. I can’t wait to make it. Can you use anise seeds? Hmmm, good question. I see no reason why it couldn’t work to make a nice tasting dessert, but it would have a completely different flavor. You might need to adjust the amount of anise, depending on how strong or subtle you like the flavor. I cook, I eat, I read, I write, and I raise a little family with a great guy. **Some pages on this site contain affiliate links to products. Clicking through this page helps support running The Levantess blog.